LOOKING FOR A TOUGH, BEAUTIFUL, SAFE AND DURABLE FLOOR FOR YOUR GARAGE, HOME OR COMMERCIAL PREMISES? Hard wearing, UV stable, lasts for years, with the additional benefits of concrete protection, excellent chemical and abrasion resistance. Minimise the risk to your family, friends, customers, and staff by incorporating slip resistant finishes to your epoxy resin flooring project. Due to the seamless nature of epoxy resin floor installation, bacteria has nowhere to hide and grow, therefore is hygienic, easy to clean and low allergen. Decorative finishes, such as flake, metallic and marble effect achieve designer looks and create a unique style for every project. Or design your own finish. Epoxy flooring is an economical and durable choice for reinventing your garage space, whilst protecting your concrete floor. Beware - it does create a lot of envy! Few flooring finishes can handle the elements of the outdoors. 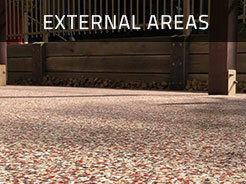 With slip resistance added, it’s ideal for driveways, pool areas, footpaths, patios and staircases. Epoxy finishes are the new black for interior designers. Hygienic and easy to clean for kitchens, bathrooms and laundries. Metallic and marble effects create stunning statements in hallways and living areas. Designers and Architects love epoxy floors due to the wide choice of finishes and because it can withstand heavy traffic, chemical and oil spills, and adhere to OHS requirements. "Euan from Tough Floors did a brilliant job, not just from a floor/product point of view, but as a company to work with. We booked the floor in and when the day came they messaged me the day before to confirm they'd be coming. On the day they were running slightly late but messaged me again to let me know. They are very polite, friendly, approachable, don't laugh at you if you don't know much about the products. They let me know what to expect, did the work, and came back when they said they would to do the final coats. The floor came up perfectly, and the bill at the end was exactly what they said it would be at the start. We've spent two years renovating and this is the first time any company we've used has done all of those things - communicated well, set and met expectations, did a very high quality job, were polite, and didn't add unexpected charges at the end. All companies should aspire to this combination of service, professionalism and quality. Very well done." Choosing the right installers is also crucial. You need expert advice, minimal disruption and a perfect job. Providing outstanding service is just as important as technical capability, because great service and bad service are always remembered. 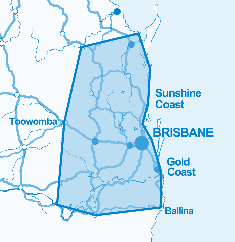 We have completed hundreds of residential, commercial and industrial projects throughout SE Qld. See our many 5 star reviews. 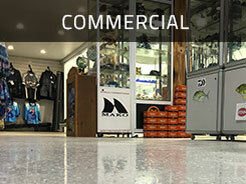 Tough Floors is a QBCC (15010428) accredited epoxy flooring company. 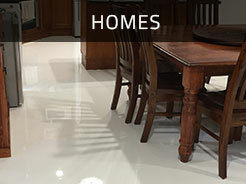 We use tested and trusted epoxy resins from reputable suppliers. The safety of your family, home and property is our first concern. We abide by all OH&S regulations, Australian Standards and manufacturer specifications. We treat each project as if it were our own home or business. We follow up your enquiry promptly, arrive on time, clean up thoroughly and always behave with professional courtesy. We enjoy researching new technology, destruct testing our work and improving designs and finishes. It’s fun and educational and we share the information so that YOU get the benefits of our experience. "Euan and the Tough Floors team are some of the most professional people our company has ever worked with. We had a disaster with the previous contractor who did not know how to correctly lay an epoxy floor. It was seriously a mess, and extremely disheartening after spending all that money. After biting the bullet and realising that we needed to start again, I called Tough Floors. Without a doubt the best decision we could have made. Euan was patient, understanding, considerate and most of all willing to do what it took to ensure we were happy."